Harvard's Chengsheng (Alex) Lu believes that the potential human health implications of colony collapse disorder extend beyond the drop in pollination — though that is worrisome enough — to the impact on humans of long exposure to low-level poisons like neonicotinoid pesticides, which have been suspected in the bee disorder. 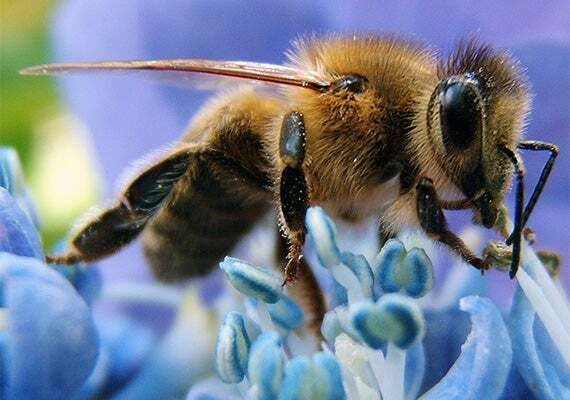 Colony collapse disorder, as the condition is known, remains a mystery with troubling implications for the fate of the human food supply, which depends, in part, on pollinators like the honeybee. Explanations that have been offered include pathogens, modern beekeeping practices, malnutrition, climate change, and pesticides. It is that last possible cause that stands out to Harvard School of Public Health’s (HSPH) Chengsheng (Alex) Lu, an associate professor of environmental exposure biology, who believes that the potential human health implications of colony collapse disorder extend beyond the drop in pollination — though that is worrisome enough — to the impact on humans of long exposure to low-level poisons like neonicotinoid pesticides, which have been suspected in the bee disorder. To Lu, it is an open question whether there are links between the pesticide and the recent increase in neurological conditions in children such as autism and ADHD. To get to the bottom of the mystery, Lu has conducted pioneering research on the impact of neonicotinoid pesticides on honeybees. In a study published in 2012, he replicated colony collapse disorder experimentally, feeding bees sugar water with different levels of neonicotinoids over 13 weeks in the summer and watching what happened. At first, nothing did. The hives seemed unaffected and healthy as they got ready for winter. Then, the week before Christmas, roughly three months after the neonicotinoid treatment was halted, hives began to fail. Eventually 15 of 16 hives collapsed, even those treated with the lowest dose. The work was noted for providing a concrete link to neonicotinoids, which are the world’s most widely used group of insecticides. One particularly disturbing aspect of the work, which Lu described during a lunchtime “Hot Topics” talk on Aug. 12 at HSPH’s Kresge Building, is that the bees that abandoned the hive during the collapse weren’t the individuals that ate the sugar water laced with neonicotinoids. During summer’s period of high activity, bees live just 35 days, so the colony that collapsed contained the next generation of bees, indicating that the effect may have been passed on between generations. Lu has continued to investigate the possible links among neonicotinoids, bees, and human health, saying the honeybee is a good model organism for potential pesticide impact, as well as for potential effects across generations. Neonicotinoids, chemicals similar to the nicotine produced by tobacco plants, have become widespread in part because of their ease of use, Lu said. Because they’re water-soluble, the chemicals are taken up by a plant and spread throughout its tissues. Seed companies have made distribution even easier for farmers by coating seeds with the chemical, which ensures the plants sprouting from them contain the pesticide. The chemicals are present not just in food plants, but are also widely represented in nursery stock, including plants sold at major garden retailers, Lu said. They’re also found in the environment, and Lu said there are questions about their role in the loss of birds and aquatic invertebrates. Lu described it as a race against time to save the bees, which are routinely transported around the country by commercial beekeepers to pollinate agricultural fields. He spoke to one blueberry farmer who said that before colony collapse disorder struck, he would pay $250,000 to have his fields pollinated. Today that figure stands at $750,000, and the cost is passed on to consumers. Lu believes that the pesticide is fed to bees by unsuspecting beekeepers. The pesticide is widely used on corn, which is used to make high-fructose corn syrup. The corn syrup is mixed with water and routinely fed to bees by commercial beekeepers. Affected bees, which include wild honeybees, Lu said, exhibit a range of neurological conditions, including disorientation, flying back to the wrong colonies, and abandoning colonies in winter. Harvard's Felix Warneken co-authored a study with former Harvard students Jillian Jordan (left) and Katherine McAuliffe that suggests that even at a relatively young age, children have advanced ideas about fairness, and are willing to pay a personal price to intervene in what they believe are unfair situations, even when they have not been disadvantaged personally.